Following the financial crisis and subsequent impacts of economic slowdown and austerity, the emergence of new local governance models and innovation is a very timely issue. The same goes for identifying new types of funding schemes and fiscal models prompted by austerity with the reduction in financial resources for local governments. 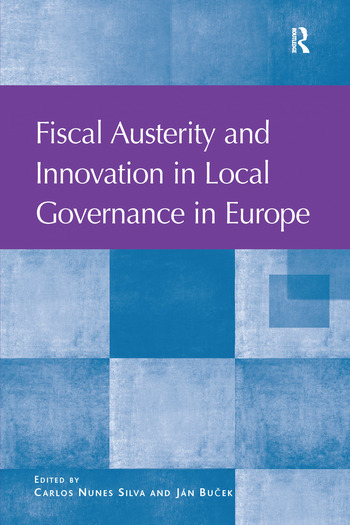 This book offers a broad perspective on some of the organizational and financial problems faced by cities and local governments across Europe and analyses the reactions and reforms implemented to address current economic and public finance conditions. The geographical coverage of the case studies, multidisciplinary background of the contributing authors and focus on a multiplicity of issues and challenges that confront local governments, not just financial issues as is often the case, means this book is relevant to a wide readership. The book is written for post-graduate students, advanced undergraduates, and researchers in the multidisciplinary field of local government studies (Public Administration, Geography, Political Science, Law, Economy and Sociology), as well as practitioners working in local government institutions. Carlos Nunes Silva, PhD, is Professor Auxiliar at the Institute of Geography and Spatial Planning, University of Lisbon, Portugal. His research interests are mainly focused on local government policies, history and theory of urban planning, urban and metropolitan governance, urban planning ethics, urban planning in Africa, research methods, e-government and urban e-planning. He is the founding Editor-in-Chief of the 'International Journal of E-Planning Research' (IJEPR). He is a member of the Steering Committee of the International Geographical Union Commission on Geography of Governance. JÃ¡n BuÄ�ek, PhD is Associate Professor and Head of Department of Human Geography a Demography at the Comenius University in Bratislava. His research focuses on various governance and development issues at the local/urban and regional levels. Currently he is the Chair of the International Geographical Union Commission on Geography of Governance (since 2008) and Vice-President of the Slovak Geographical Society (since 2010).